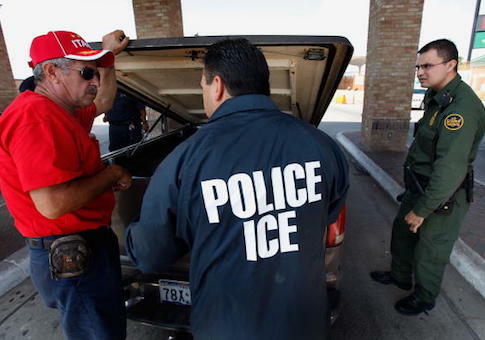 74 percent of those arrested by the U.S. Immigration and Customs Enforcement (ICE) agency in FY2017 had past criminal convictions, according to a new analysis from the Pew Research Center. The remainder of those arrested by ICE were further broken down by those with pending criminal charges—16 percent of the total—and those with no criminal charges—just 11 percent of the total. The total number arrested with past criminal convictions is a substantial increase from FY2009, the earliest year for which Pew could obtain data. That year, just 39 percent of those arrested by ICE had past criminal convictions, as opposed to 61 who did not. The number of ICE arrests decreased by more than half over the period between FY2009 and FY2017, the period during which President Barack Obama was in office. That decrease, Pew shows, was almost exclusively driven by a decline in non-criminal immigrant arrests. ICE arrests rose again this past year, up 30 percent in President Donald Trump’s first year in office. That increase was driven by an executive order, issued in Trump’s first days in office, which expanded the number of priorities for removal, focusing on both those illegal residents who had committed any kind of crime, as well as those who violated a number of non-criminal standards, including illegally receiving welfare benefits. The increase in ICE arrests under Trump, Pew noted, concentrated almost exclusively among those who had no prior criminal conviction. Arrestees without known prior convictions rose 146 percent under Trump, while arrestees with prior convictions rose just 12 percent. In half of all ICE administrative regions, non-criminal arrests rose by 200 percent or more. The most common prior conviction in FY17 was driving under the influence of alcohol, Pew found, making up 16 percent of total convictions. Next was the sale of dangerous drugs, like opioids, making up 15 percent of total convictions. Immigration offenses like false entry or false claims to citizenship were 14 percent. Assault charges made up eight percent of convictions, but other violent crimes — sexual assault, kidnapping, and homicide—made up less than one percent apiece. The proportion of arrestees with prior offenses varied based on region. In the Los Angeles field office area, which covers southern California, 88 percent of those arrested had a prior conviction; the Newark field office area, which covers New Jersey, had just 60 percent.